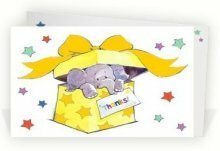 Sending out baby gift thank you cards is simply the best way to express your gratitude to friends and family for all the wonderful gifts and kind wishes you receive as you introduce your new baby to the world. Whether you're a first time Mum or you've just added to your family, it can be hard to start thinking about how to say thank you for the all the gifts that you receive. And your new baby will be taking up most of your time! I vividly remember feeling a little panicked at the prospect of how to send personalised thank you notes to everyone! I made my own baby gift thank you cards! Like many new mums, I was being careful with money when my son was born, so I could stay at home with him for as long as possible! of new baby cards at TinyPrints.com! So, I decided to make my own baby gift thank you cards, using my own photos of my son! I gave Ben a bath and washed his hair so it was beautifully soft and fluffy, then I dressed him in a citrus striped babygrow and propped him up on our bed with heaps of pillows. This looked lovely because all our bed linen was white. I'm certainly not a photographer (!) but I managed to get some super shots of my cherub looking simply adorable. All I did then was choose my favourite and print off lots of copies. I bought a supply of 5 x 7 white folded greetings cards and sheets of 5 x 7 scrapbook paper with tiny blue angels on it. I also bought a supply of 3 inch diameter blue circle cardstock (with a hole in the middle). I used craft glue to stick one sheet of scrapbook paper to each card, stick my baby's photo in the centre of the card and stick the circle card stock over the photo. My family and friends told me how much they loved the cards and all the personal greetings I wrote! Why not see how creative you can be, and try making your own baby thank you cards? Too rushed for DIY cards? Of course, not every new mum has the luxury of enough time to make thank you cards! If your hands are busy enough already, I recommend you visit Planet Cards or TinyPrints.com and check out their supply of stunning cards for all occasions. a baby boy, girl or twins!